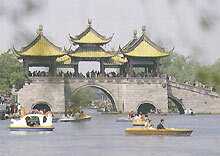 Yangzhou is a famous cultural city with a history of more than 2,400 years. 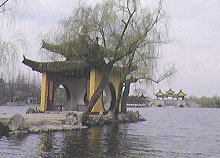 Situated on the northern shore of the lower section of the Yangtze River, with the Beijing-Hangzhou Grand Canal running right through the city from south to north, Yangzhou is renowned for its central location, abundance of natural resources, valuable cultural heritage, and beautiful gardens. Emperor Yangdi of the Sui Dynasty had visited Yangzhou on three occasions. During their inspection tours of south China, both emperors Kangxi and Qianlong made it a point to stop over in Yangzhou. Classical gardens there are more than a hundred of them -- are a major part in the city's tourist resources. The city is known for its green mountains and sparkling waters. The architecture in the gardens of Yangzhou is a combination of imperial gardens and private ones and blends the magnificence of northern gardens with the statuesque grace of southern gardens. Better known gardens in Yangzhou include the Slim West Lake, the Geyuan Garden with its artificial rockwork, the Heyuan Garden known for its chambers and terraces, the Xiaopangu Gully with zigzagging paths. A visit to Yangzhou on a moonlit night is a most relaxing experience in one's life.